At The Mad Table we’re mad for romance and love…especially on Valentine’s Day! Valentine’s is all about showering those you care for with memorable cards or presents, alluring atmospheres, and of course, indulgent cuisine. Although Valentine’s Day is thought of as a day for lovers, we believe it’s the perfect time for the whole family to show love for each other. Check out our ideas, below, to make this Valentine’s Day special for those in your life. Instead of store-bought cards, show your little ones how to make origami flowers and hearts out of pink and red paper. Each piece is special and can be used as a Valentine’s card or for decorative tablescaping. Breakfast is a time when the whole family gathers together (or at least, speaks to one another over a quick coffee), and it provides the perfect moment to set the tone for the day. 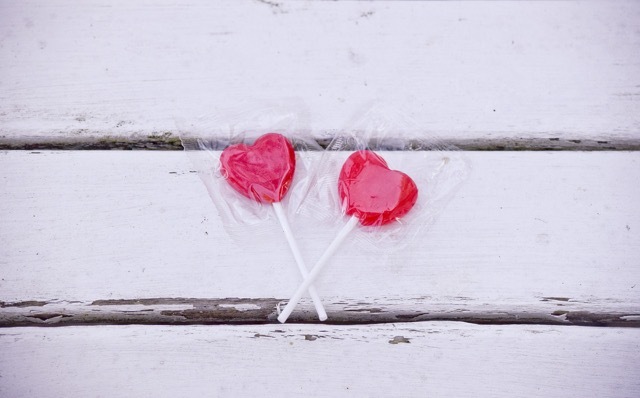 Start a new holiday ritual of giving each other a small, thoughtful gift to commemorate Valentine’s Day – something simple, perhaps, that shows gratitude and affection. For those who stop to eat, prepare festive, pink breakfast smoothies blended with fruits such as strawberries, cherries, or raspberries. Decorate each glass with a pink paper straw. Using a heart-shaped cookie cutter, you can make regular pancakes or waffles festive and fun! As the children race out the door, put a lunchbox filled with Valentine’s specialties in their hands. Use that same heart-shaped cookie cutter to prepare favorite sandwiches and include a note that tells them how special they are to you. These tips work for a spouse’s lunch, too! For the evening events, prepare a family movie night with a film everyone will enjoy, like The Princess Bride or Lady and the Tramp. Make pink or red popcorn by popping regular popcorn. Boil sugar, water, butter and a bit of food coloring for three minutes, then allow to cool. Pour the mixture over the popcorn and let dry on a cookie sheet. As we all know, the most important part of Valentine’s festivities is dessert. 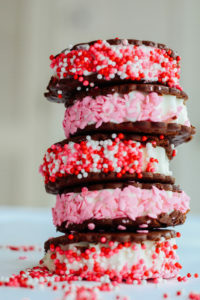 Make ice cream cookie sandwiches by baking your favorite cookies and decorating them with heart-shaped candy or pink frosting. 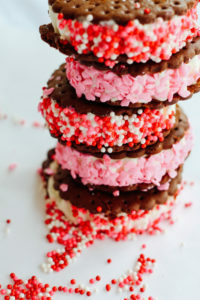 Sandwich a layer of ice cream between two cookies and roll them in pink and red sprinkles. If you’re strapped for time, add sprinkles to store-bought ice cream sandwiches. 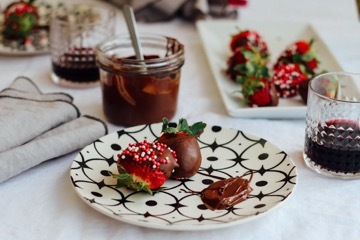 For a more traditional Valentine’s treat, use a slow cooker to make chocolate fondue. Dip strawberries, marshmallows and bite-size brownies and cover them with candy and sprinkles. Whatever the plan for February 14, make sure to share the day with the people who mean the most to you. Happy Valentine’s Day from The Mad Table and don’t hesitate to contact us if you need assistance making the occasion extra special. Be sure to like The Mad Table on Facebook and follow us on Instagram for all the latest news, fabulous recipes and entertaining tips and ideas.